Takion was once Josh Sanders, a blind young man, who as fate would have it was chosen by Highfather to become the living embodiment of the Source. He was elevated to godhood and renamed Takion. 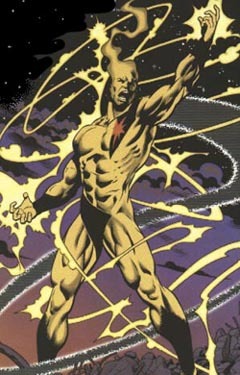 He serves as a conduit and avatar, between the Source and the New Gods of New Genesis. He is a relative newcomer to the world of the New Gods, so when he was chosen to become the new Highfather, many were amazed, especially Takion himself. But he has taken on the task to the fullest, using it as a chance to further explore the extent of his powers and his being. Since becoming Highfather, Takion has gained advice from the late Izaya and has been involved with Beautiful Dreamer. Takion can manipulate matter and energy of all forms. He is a being of limitless power, so there is very little Takion cannot do.